(Phys.org) —A new study undertaken by a diverse group of scientists in Sweden has found that contrary to popular belief, most of the carbon that is sequestered in northern boreal forests comes about due to fungi that live on and in tree roots, rather than via dead needles, moss and leaf matter. 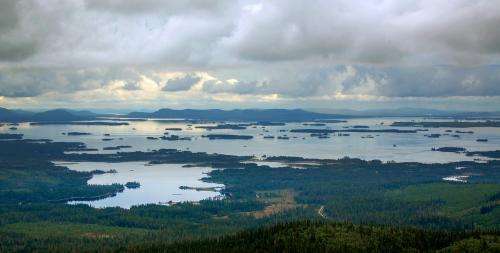 In their paper published in the journal Science, the team describes their findings after taking soil samples from 30 islands in two lakes in northern Sweden. Scientists have known for quite some time that northern forests sequester a lot of carbon—they pull in carbon dioxide after all, and "breath" out oxygen. But what the trees actually do with the carbon has been a matter of debate—most have suggested that it's likely carried to needles and leaves then eventually drops to the forest floor where over time decomposition causes it to leech into the soil. If that were the case, this new team of researchers reasoned, then the newest carbon deposits should appear closest to the surface of the forest floor. But this is not what they found—instead they discovered that newer deposits were more likely to be found at deeper levels in the soil. This was because, they learned, the trees were carrying much of the carbon they pulled in down to their roots (via sugars) where it was being sequestered by a type of fungi (ectomycorrhizal, aka mycorrhizal fungi) that eats the sugars and expels the residue into the soil. 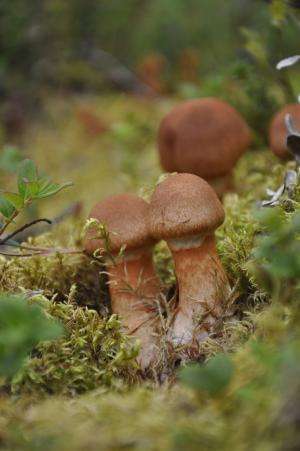 In their study they found that 47 percent of soil carbon found on large island samples came about due to fungi, as did a whopping 70 percent of carbon in small island soil samples. Thus far, the team is only able to guess why there are such differences in the soils, but theorize it's likely due to differences in decomposition rates. The amount of carbon stored in northern forests and how, is important because such trees cover approximately 11 percent of the Earth's surface and recent research has calculated that they hold approximately 16 percent of all worldwide sequestered carbon. And that's important, of course, because as global warming occurs, more sequestered carbon is released due to faster decomposition rates of dead forest matter. What's still not clear, however, is whether an increase in new forest growth due to warmer temperatures in more northern areas is likely to offset the increase in release of the sequestered carbon. So the big dream here is to genetically engineer trees that store stupid amounts of sugars in their roots a genetically engineered fungus that is really really hungry. With the Earth approaching all time lows in CO2 in the atmosphere, it is noticed that levels are still dropping while deforestation is at an all time high. The recent effort to harvest more trees is spurred by the a new issue that is killing woodlands hundreds of acres a day. It seems a new fungal infection is stripping trees of sugars and they are unable to recover. With total collapse of the woodlands emminent it seems the CO2 levels have reversed trend and are raising sharply to 2014 levels. "I for one welcome our new fish overlords"
This is not going to go over well with the Political Class of posters on this website. All we're about to start reading from them is how all this became "settled science" years ago & science studies & research like this is simply diversionary from their cherished "settled science". Science is not "static" subject matter, it is constantly evolving to provide us with increasingly better knowledge & standards by which to conduct our personal lives & improve our habitat. Good job to the researchers who understand it is more useful to pass on knowledge such as this, rather than genufleck to the "political class" and their archaic religious practices which never in the history of mankind has ever resulted in a better quality of living wherever they dominate the debate.